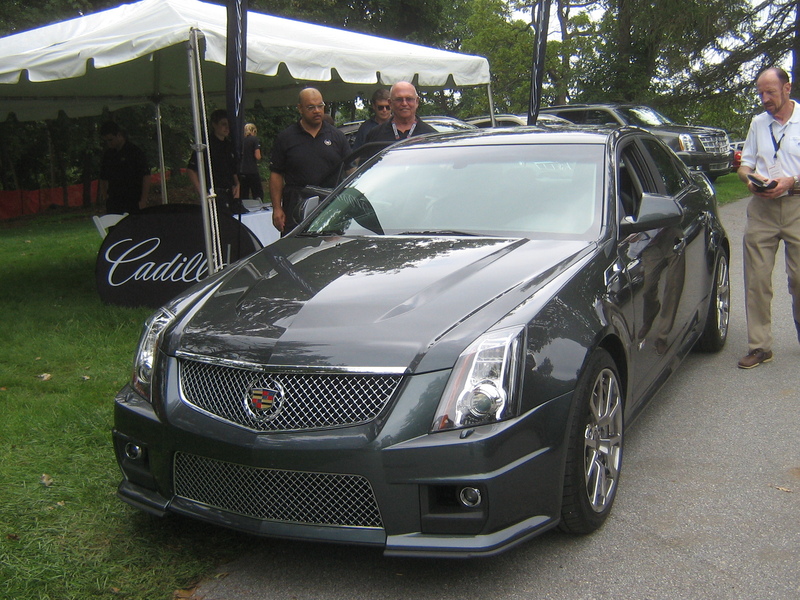 Back in the fall at the Radnor Hunt Concours, I took an opportunity to drive a couple of new Cadillacs. Most of you know I drove an Escalade Hybrid, but the real treat was to yet again sample that great-tasting supercharged V8 which lies in the engine compartment of the CTS-V. In this case, the test car was the deep gray sedan you see above. It had a few options that the coupe I drove back in June did not, so I took it for a drive (on much different roads than the coupe) around the rolling hills of Pennsylvania’s countryside. Stepping into the Cadillac’s interior feels of course, pretty familiar. This one, unlike the coupe I drove, was equipped with Recaro seats and a steering wheel covered in Alcantara. The black interior on this model looks much more sinister than the red coupe’s tan hides, which don’t do justice to the speed this car can achieve. The quality is a cut below that of the E-Class but it’s by no means low-rent for the pricetag. The chrome rims set off the dark gray paintjob pretty well, while the angular styling works better on the sedan, in my eyes, than it does on the coupe (I think it looks a bit more formal and proper). Of course, the Cadillac badge sits proudly on the grille, warning all comers that they’re in Detroit’s house. This one in particular was equipped with the automatic gearbox as well, but without the power sunroof. It does come standard with a high-end audio system, navigation, a rear-view camera, and of course, 556hp (which is the most important ingredient). As the roads were vastly different in Pennsylvania than they were in Greenwich, I got to sample this sedan on backroads and examine the chassis of the design itself further. Firstly, even on rougher roads, the magnetorheological shocks give this car an excellent ride, both firm and yet comfortable. The entire car feels stapled to the asphalt no matter how rough or how complicated the surface becomes. The seats, while much grippier than the leather chairs I sampled previously, still offered enough comfort as well. A huge benefit of the sedan body is a lack of blind spots compared to the two-door model, whose thick rear pillars hinder rear 3/4 visibility and make parking a bit tough at times. 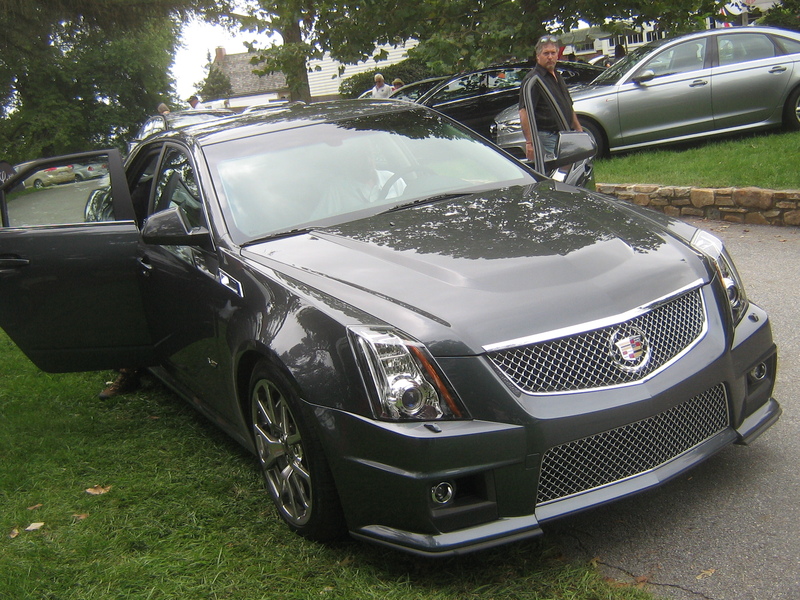 Of course, from the front, nothing is any different, meaning that the CTS-V’s throttle response is still scintillating. The engine’s V8 bellow gives in to a hilarious supercharger whine, and the entire package catapults you into the next galaxy. Like I recalled from the coupe, the CTS-V, in any flavor, is one to be savored. The fact that it drinks fuel and that it’s not at all subtle add to the fun. It accelerates like nobody’s business, sounds like fire, and rides great. 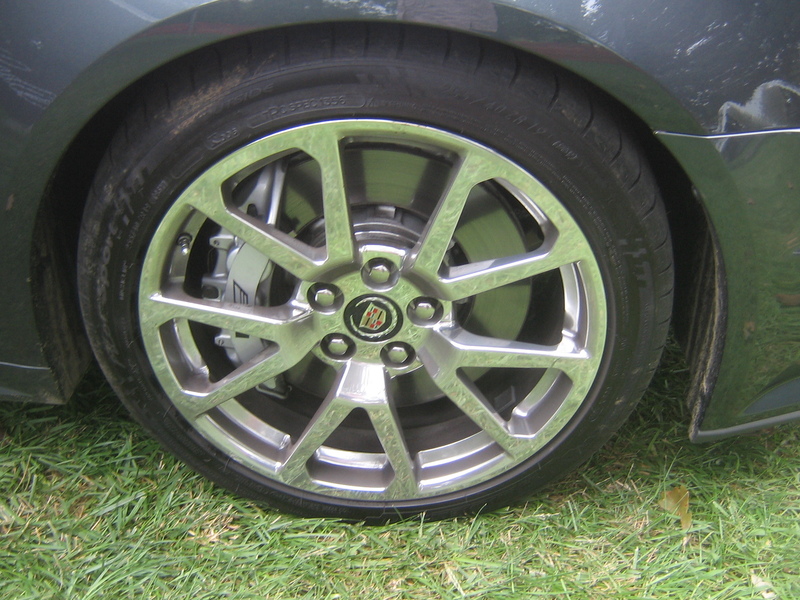 But, in the corners, the big Caddy absolves Cadillac of most of its sins committed in corners by its big, heavy, softie predecessors, as it feels great in tight corners. I took a few corners in it at “safe” speeds, and all the talk about tuning this chassis on the Nurburgring came together. The big CTS-V never feels unsure of itself around corners. The steering picks up everything it needs to, the tires stay exactly where they are, and any insecurities are wiped off the table. I’ve driven a few AMGs, and the CTS-V just feels more planted in turns, and feels much lighter on its feet than its specs would lead one to believe. Body lean is nicely checked, and the brakes are more than adequate for the job. If there’s any bad points, it’s the car’s wide hips, which require care in tight spaces, as I was especially afraid to scratch anything along the rock wall. 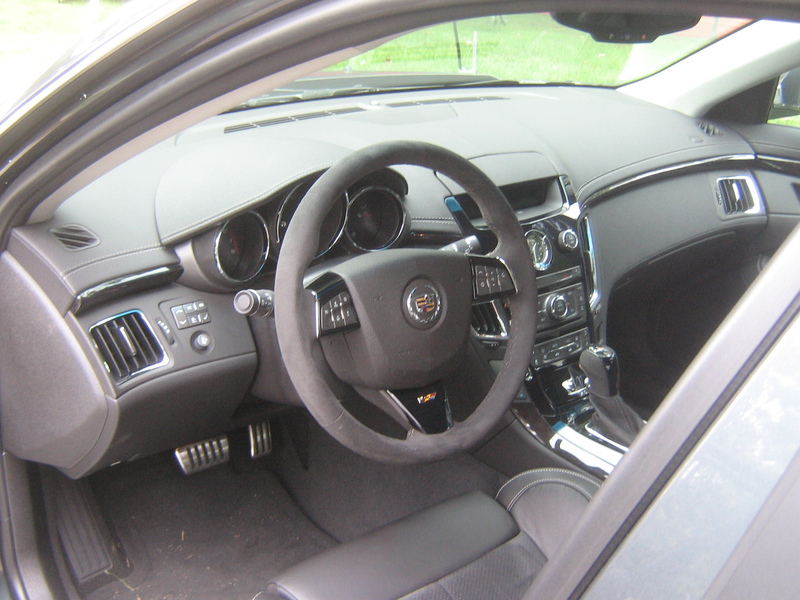 The only other drawback is the fact that it uses a standard automatic with shift paddles; the paddles don’t necessarily feel perfect, and the transmission itself should be replaced with a dual clutch unit to bring the CTS-V into a modern era. The Cadillac’s pricetag is what really nails it home right now, as a similarly optioned 2012 model will at the moment go for about $73,000–not a small amount of money, but still cheaper than a Mercedes E63 AMG (starts at $88,900), a Jaguar XFR (starts at $82,000), and the upcoming F10 BMW M5 (which will start at a price similar to the Mercedes when it goes on sale later this year). So, it’s a bargain, outpaces the Jag and the Merc, and is currently the only offering of its kind with a manual transmission option (BMW will offer a manual in the new M5 here as well in a few months’ time). So, would I buy one? Well…is Washington, D.C. the capital of this country? You figure it out. And if you haven’t, I love this car, and I’d rate it a 9/10 any day.